Found a strange word? Then quickly look it up with click.to dict.cc! Would you like to read eBooks in German and have the ability to quickly look up a word without having to change windows? Wouldn’t that be great? Highlight the word and simply let click.to dict.cc find the translation. You only need to select the word, press CTRL + C or right click –> copy and click on the on the dict.cc icon above your mouse pointer to start the dictionary search. click.to shows you the suggested translations automatically from the dict.cc dictionary. So you don’t have to close your eBook for even a second! 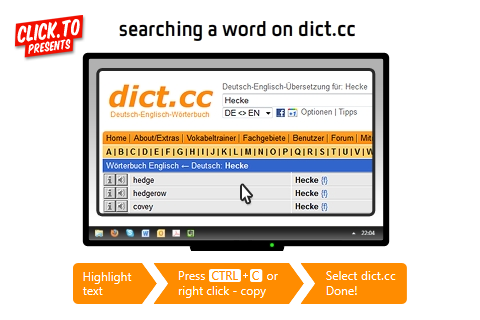 With click.to, dict.cc can be reached from anywhere on the desktop – even without a previously copied word on the clipboard. Just enable “Quick Access” in the click.to options menu and view the click.to satellites by moving the mouse cursor to the top of the screen. Select dict.cc and enter your question: click.to automatically opens your Internet browser,goes to the dict.cc and enters your search results immediately!